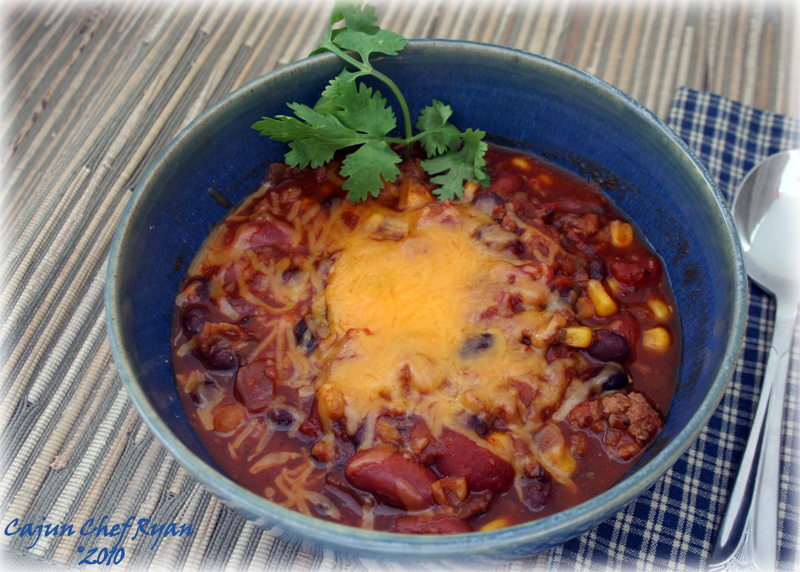 This is another crock pot slow cooker recipe that is sure to please any chili fan! Quick and easy to prepare, just add the ingredients to the crock pot and in about six to eight hours on medium heat you are ready to eat. I used a pint of my Fire Roasted Tomato Sauce for this recipe, and if you have the time or have some on hand this is a great sauce, if not, then 2 cups of other tomato sauce will suffice…I guess! We made this dish as our contribution to the Wake Forest – Rolesville High School Band Parent’s Booster kickoff dinner meeting. The band gave us a preview of their halftime show routine, and then a short volunteer meet and greet, followed by the dinner. Since the meeting was set for 5:30, we needed something that would be easy to make and warm up, this fit the bill. Monique even got to march with Ben in a short portion of the movements, it was a hoot! Each band member had one parent shadow them in the first movement of the routine and it was hysterical! 1. In a large saute pan heat the olive oil then saute the onions, and shallots until translucent, and then add the garlic, and ground turkey meat. Brown the meat until pink is gone. 2. Add the browned turkey mixture to the crock pot, then add the remaining ingredients and stir well. Cover the crock pot and turn on the slow cooker to a medium setting. Allow to cook in the slow cooker for 6 – 8 hours. 3. Stir well occasionally, serve with shredded cheese and/or sour cream of desired. And garnish with fresh cilantro if desired. Man! This bowl of chili!!! Why wait for fall? This recipe will be a great way to use up the excess of tomatoes my bf has. Why he felt he needed 14 beefsteaks plants this year is beyond me. Thanks for this solution CCR! Great looking and sounding recipe! I’m definitely bookmarking the recipe for when things cool down a bit here. I know my family will love this! I’ve yet to meet a chili I don’t like – this looks marvelous! Have a wonderful yummy weekend! That looks so very good. I can hardly wait for the cooler weather . I like the idea of using the fire roasted tomatoes and ground turkey. I don’t have many slow cook recipes and this one looks delicious. My new range has a setting that is low enough to use crock pot recipes. I’llhave to gibe this a try. I love the combo of beans. Thanks. Guten Appetit! That’s a delicious looking dish! Yummy!!! I don’t eat beef and I love turkey chili!! this version sounds over the top delicious! I love what you did with it, the corn was definitely a nice touch! An excellent bowl of chili – great combo of ingredients and delicious flavors! Oh, I love crock pot recipes! I have never tried garbanzo beans in my chili, i’ll have to give it a try, thanks! Oh..this looks SO good! I’m going to have to make a big pot of this over the weekend. Great recipe chef! I have to learn to use my slow cooker…..still brand new. Just throw everything in and I can go and play…that’s cool 😀 Lovely recipe…..I like. Thanks very much for sharing. Hope you have great weekend. Mmm. Looks delicious. My slow cooker hasn’t been used much this summer but as it’s beginning to feel more autumny here I’ll have to get it out again for this. I love using the crock pot and this is the perfect recipe! brilliant.. cajun chef…u must be in cloud 9 now…. Great job on making the Top 9! Hey folks, and Happy Weekend! Today is the 5th anniversary of Hurricane Katrina, and it is a day of remembering all who died and all who moved and have not been able to return to the City of New Orleans. Of course, we cannot forget those who still live in NOLA and contribute to the rebuilding of the Crescent City. Thank you all so much for supporting CCR and being a part of our great online foodie community! I’ve never put garbanzo beans in my chili…a must try. All I can say is mmmmmmmmmmmmm……looks soooo good!! the vibrant colors in this dish makes me want to dive right in! I love chili! This one looks phenomenal. I have been so excited that fall is almost here so I can make some tasty chili…this recipe is now making me crave it! I will have to try this one! 🙂 Congratulations on making the top 9! This Chili is getting bookmarked. It sounds delicious! This looks fantastic. I love the slow cooker any time of year and am really enjoying everything from appetizers to desserts in it. Thanks for another must-try recipe! Mmmm! The weather’s cooling done here–perfect time for chili! Wonderful looking dish! Must try! 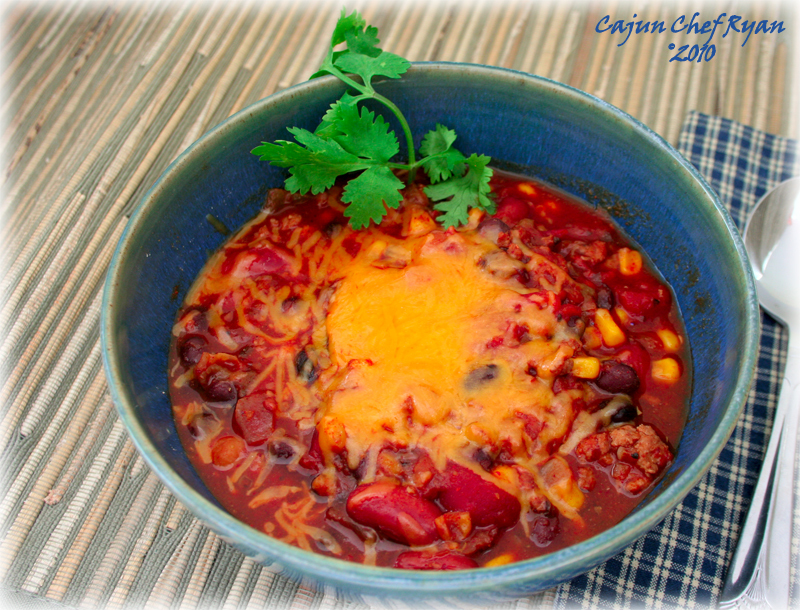 We are getting ready to have some “cooler” weather and I have a bad craving for chili right now! This recipe will be put to the vegan test as I will substitute ground vegan sausage for the turkey. Yum and thank you CCR! I have never made chili in the crockpot before. This sound perfect for the upcoming fall weather. It must smell amazing when you walk in the house after a long day.